Samuel Upsall was born in Sherborne, Dorset, in 1849. He was the son of plumber James Upsall (b1811) and his wife Jane. In the 1851 census James and Jane, together with their four children and a domestic servant, were living at Newland, Sherborne. By 1861 the family had moved to Cheap Street, Sherborne, but 12-year old Samuel was the only child still living at home. James employed three men and the family had a 13-year old domestic servant. By 1871 Samuel was living and working with Watchmaker and Jeweller John Deacon in High Street, Lewisham, Kent. 22-year old Samuel listed his occupation as a Watchmaker. In the winter of 1873 he married Mary Ann Neal, originally from East Chelborough, at Beaminster, Dorset. After their marriage Samuel and marry lived for a few years in Colchester, Essex, where their two children were born: Susanna Elizabeth (b1876, known as Susan) and Edmund J (b1879). The family had moved to 116 Middle Street, Yeovil, by 1879 since his advertisement in Whitby's Yeovil Almanack Advertiser of 1882 said "Begs to thank his customers for the kind support accorded to him for the past three years....". During 1880 another daughter, Eliza, died in infancy and in 1881 and Mary and the surviving children were listed at Middle Street in the census. Samuel was away from home at the time of the census, visiting Elizabeth Laver and her family at King's Farm, Powerstock (just outside Beaminster). 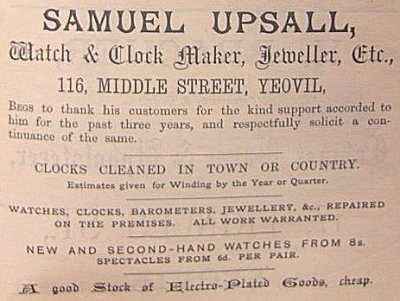 Whitby's Yeovil Almanack Advertiser of 1882 listed "Samuel Upsall, Watch & Clock Maker of 116 Middle Street" and a similar listing appeared in Kelly's Directory of 1889. Samuel, Mary and the two children were at the same address in 1891 when Samuel again gave his profession as a Watchmaker. He briefly had a shop in Wine Street before moving to Cheap Street, Sherborne. His shop at 116 Middle Street being acquired by WH Sime & Co.
During his time in Yeovil, Samuel is known to have taken on Edward Gillam (b1867) of Park Street as an indentured apprentice. Gillam later set himself up as a Watch and Clockmaker. Samuel owned the dwelling house, garden and premises in Cheap Street later described as "containing by estimation 29 perches (more or less) and possessing the following accommodation - Front Shop, Front and Back Parlour and Dining-room, 7 bedrooms, WC and attic, Kitchen and Back Kitchen, WC, Coalhouse and large Workshop, two floors. Garden, well-stocked with excellent fruit trees, also a Vinery." On 21 April 1894 Samuel was walking along the railway line between Bradford Abbas and Yeovil Junction but, while attempting to avoid one train, he was hit by another train coming from the opposite direction and killed - see full story below - he was aged 45. Mary died in Sherborne in 1898, aged 53. Samuel's advertisement in Whitby's Yeovil Almanack Advertiser of 1882. The report on the accident and subsequent Coroner's Inquest into the accident that killed Samuel Upsall, from the Taunton Courier's edition of 25 April 1894.